Continuing from the previous article providing details on planning a trip to Srinagar; in this post I will discuss in details the best time to visit Srinagar. To be honest, there is really no straight answer to this question as it would be different for every person. Some people come to Kashmir seeking lush green meadows; whereas snow is what attracts a lot many other people. Being away from crowd and spending some time in solitude is the agenda of the trip for some; while others love being among the crowd. Sometimes Srinagar is merely a part of Ladakh ride and sometimes, it serves as the base to explore the beautiful valleys of Kashmir. Whatever the situation, the fact remains that Srinagar is among the most beautiful cities of our country; and is definitely worth visiting. If you too have been thinking planning a trip Srinagar or Kashmir then in this article, I will provide some information on how the city looks at a certain time of the year. Depending on your own preference, you can then decide when would you like to be here. So what really makes Srinagar worth visiting? Why not just head towards any other hill station? The answer to this question really is in the fact that being in Srinagar gives you access to visiting some of the most desired destinations of India. Places like Gulmarg, Sonamarg and Pahalgam are merely a couple of hours away. Not only you will be able to explore Kashmir as much as you like; you can always extend your trip by a few more days and head towards valleys of Zanskar and Ladakh. Even if you were just staying in Srinagar city, there are so many places to see here that it will keep you busy for a couple of days and you will still not be done. When is the best time to visit Srinagar? It then brings us to the question of the best time that you should plan a trip to Srinagar, or in general Kashmir. This will entirely depend on what you seek and some other factors like how are you traveling, is there a budget limitation and how many days you have in hand. Further in the article, I will provide a detailed explanation but as a quick summary, if it is snow you are after than February is the best time to visit. If lush green is what interests you then you should plan a trip in April, August or early September. If you want to avoid being in a crowded place then April, May and June may not be the best time for you. Read on for a more details on the topic. The greatest thing about Srinagar is that out here, every season has its own charm. Come winter and in the months of January till March, the place turns into a winter wonderland with temperature dropping as far as -10 Degrees Celsius. It the time when the beautiful Dal lake freezes over completely and becomes a playground for cricket matches. It is also the time when people from all over the country arrive here to witness beautiful snow covered valleys. The slopes of nearby Gulmarg see an ambush of skiers. With that being said, too cold is not really everyone’s cup of tea. Most of the people would prefer a moderate enough climate due to which, the months from April to June are widely considered as the most popular time for tourists. Weather in these months is very pleasant with temperatures range between 10 degrees to 30 degrees Celsius. Spring season arrives here in April and in first two weeks of the month, you can also see the dazzling rainbow colors of the Tulip Festival in Srinagar. This is the time when the famous Tulip garden of Srinagar, which is also Asia’s largest tulip garden, is at its full blossom. Monsoon arrives here towards late June or early July and can very well last throughout August. Historically and in an ideal world, Srinagar should actually be getting very moderate rainfall but that is no longer the case, thanks to all the global warming. The 2014 floods of Kashmir and a flood-like situation in 2018 stands witness to this face. Therefore it can be a good time to avoid visiting Srinagar. Monsoon however does leave behind lush green valleys making it a photographer’s delight. So if greenery is on your mind then try planning a trip towards second half of August or early September. By this time, monsoon would have subsided but plenty of green would still be around. The vistas at this time are mesmerizing which makes these few weeks another great time to visit Srinagar. Autumn season begins towards end of September turning the entire valley golden; presenting all imaginable hues of yellow, gold and orange. It is often considered as a magical time to be here with pleasantly cold nights, misty mornings, red-carpeted gardens and rustle of fallen leaves. The magic however mostly remains till October and it kind of turns a bit dull in November. Come December, it can then snow in the valley anytime. Now since we were just talking about July and August not being a good time, another factor to consider here would be the independence day. This is the time when there is tons of security all around and chances of violent protests are at maximum. If you were thinking August, then try not to plan your trip in first half of the month; or at least avoid the week of 15th August. Let Independence day pass and make your plans for later half of the month. This is another reason why you would want to avoid visiting in June, July or August. Apart from the monsoon season and unpredictable rains, it is also the time of Amarnath Yatra that brings thousands of pilgrims in the valley. It can get crowded with additional security measures causing road blocks. If you are someone who tends to stay away from the crowd then this is not the best of the times for you. Same deal as Independence day. Try to avoid visiting in second half of the months or at least the week of Republic day. Also Read: Is Kashmir Safe for Tourists to Travel ? 90% of the people in Srinagar are Muslims which means that the city will largely remain closed during the entire month of Ramzan which makes it a really bad time to be visiting Kashmir. Pretty much the same situation as that of Ramzan, whether it is Eid or Bakra-Eid. Several of the hotels remain completely shut down the entire week of Eid as their staff goes home for festive celebrations. The ones that will remain open will be functioning of very less staff. Don’t be surprised if you found that the hotel was open but there was no one to cook; or clean the room for you. You may find a room in the hotel but will have to eat outside. Srinagar mostly experiences a pleasant weather all around the year. Days however can feel a bit hot during peak summer; and it can indeed get terribly cold during peak winter. Monsoon too, as I mentioned above, have started to wreak havoc in recent years. Let me give a month by month breakdown of how the weather in Srinagar trends in the year. Winter is at its peak and you will definitely feel the chill in the wind. Pack all your woolens and heavy windproof jacket if visiting this time. Average temperature of Srinagar in January will remain about 3 degrees Celsius. At nights, it can drop down till -5 to -7 and at noon, will rise up till 12 Degrees Celsius. It can snow anytime but the amount of snow on the ground will be a bit less towards earlier part of the month. The weather will mostly remain the same as January but the amount of snow will be far greater. Average temperature of Srinagar in February will be about 5 degrees Celsius. Nights will be extremely cold with temperature dropping below zero; but days will be pleasant with temperature at noon touching almost 15 Degrees. Snow will start to melt and will be gone from the city by end of March. Average temperature will rise to 12 Degrees. Nights will remain close to 0 but won’t drop below it. Day temperature at noon will rise till 27 Degrees Celsius. Spring season arrives and it will start to get warm. Day temperature may as well go up till 30 Degrees Celsius. Nights will be pleasant at about 6 to 7 Degrees. Average temperature of Srinagar in April will be close to 16 to 18 Degrees. By May, you may actually start to feel a bit hot during noon. Its peak tourist season and city may even get a bit crowded. Average temperature will be about 20 degrees Celsius. Nights will dip down to 10; whereas maximum day temperature will be around 30 Degrees. It may even start to rain towards end of June and Amarnath Yatra too will begin. Average temperature will rise to 24; night lowest will be around 15 and day highest temperature will go as far as 35 Degrees Celsius. Yes it will get hot during day. Monsoon would have arrived and it will be raining all over; not a good time to visit. Average temperature will remain same as that of June but the rains may cause the temperature to drop down below by a few degrees. Independence day celebrations will be on and it will be tense all around. A lot of security can be seen everywhere. Average temperature will remain around 25 degrees Celsius. Night’s lowest will be around 15 degrees whereas days can be as hot as 35 Degrees Celsius at noon. Another good time to visit. Weather will start to turn pleasantly cold. Average temperature will dip down to 20 Degrees. Nights will start to get cold at a minimum of 9 Degrees where days will still be warm at 30 Degrees Celsius. Autumn is here and the valleys are Golden. But this month also marks the beginning of winter in Kashmir. Temperature at nights will start to go as far below as 5 Degrees and Day’s maximum will be around 25. Average temperature at this time is around 15 Degrees Celsius. Not a good time to visit. Vistas will be dull but weather will be very cold. Nights will start to drop below 0 and day temperature will also come down to 20 Degrees maximum. Average temperature will remain around 7 to 8 Degrees Celsius. Winter is here and it can start to snow anytime. Average temperature will dip down to 2 to 4 Degrees Celsius. Night temperatures will remain below 0 and day’s maximum will be around 17 Degrees Celsius. 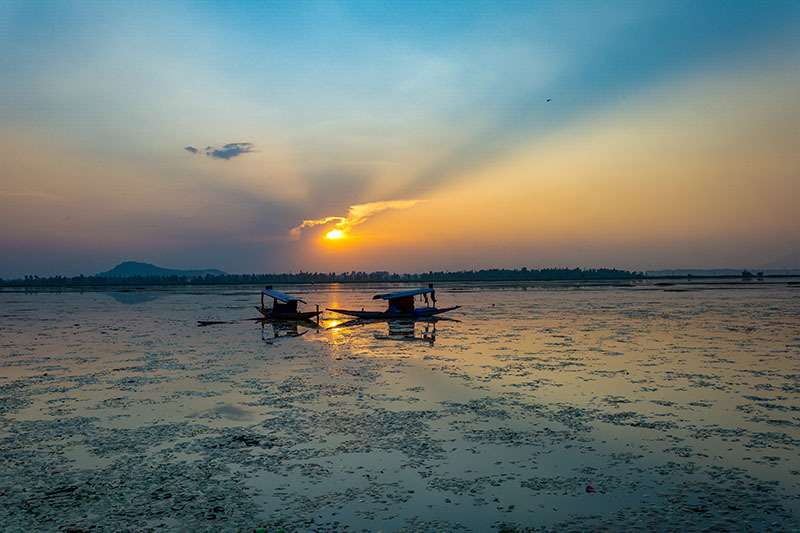 So based on the information above, the months of February, April, May, Late August, Early September and Early October can be called as the best time to visit Srinagar. Visiting around Republic Day, Independence Day, in the month of Ramzan and in the weeks of Eid is not the best choice of time for being in the valley. In my opinion, best time to visit Srinagar for snowfall will be the month of February. You can come here in January as well but in February, the amount of snow on the ground will be higher. It will actually depend on when you got married but the best time to visit Srinagar for Honeymoon would be either February or the months of April and May. The months of February, Late August, Early September will be the best time to plan a trip to Srinagar, Pahalgam, Gulmarg. Gulmarg gets too crowded in April and May and then Pahalgam gets crowded in June and July due to Amarnath Yatra. Any time between May till September is good enough if you want to visit both Srinagar and Leh. Do keep a check on the weather though in Monsoon season and if it was raining heavy, then postpone your trip by a few weeks. I will say early October is the best time to visit if both Vaishno Devi and Srinagar were on your mind; because that way, you get to be here during Navratras. Apart from October, the months of April, May and September too are equally good. I hope the information above was of help. If you need any further details; or have any other questions; please feel free to ask in the comments section below; or at our Community Forum; and I will be glad to answer.